I'd like to invite you to hop on board this train as it crashes 100 miles an hour joyfully through the walls of music tradition and takes us to places we've never been before. There are stories of adventure and intrigue that arise as my team and I continue to bring together the opposing forces of blues and classical and mash that up with other genres. And you can join me on my past, current, and future travels, encountering some amazing artists, and ride into the deep curious places where inspirations flow fearlessly. Don't worry. I will be offering more free audio downloads and other perks, and you will be able to stay in touch and be informed with upcoming concert dates, new recordings and other news. P.S. I call everyone 'Cousin' because I experience a deep connection to people. Anyone who is a fan is automatically a special friend. James Cotton, Mattie, Little Walter, Unknown, & Muddy Waters. It was 1965, I was 21 years old and hopelessly in love with the blues. For a year I had been dancing around the house in ecstasy listening to Howlin' Wolf and Muddy Waters recordings. I was mesmerized as I played one single blues shuffle riff on the piano over and over - for months - laughing and singing, driving my family nuts. I rigged up a bass drum and high hat under a funky Wurlitzer Electric piano. This way I could accompany myself with my left-hand on the piano, harmonica in right hand and friend Jim Schwall playing guitar. We put together a little repertoire so we could just enjoy, and get carried away inside the power of music. However, the natural urge to share inspired us to look for places to perform in public. We journeyed way across the other side of the tracks, on the deep south side of Chicago. I was unaware that we were walking into one of the most iconic blues spots in the whole world. With the greatest of naivety I asked the owner Johnny Pepper if we could play at his place. It was Pepper’s Lounge on 43rd street. He told us to bring in our equipment set up on the floor and play for the afternoon ladies crowd. To our delight and utter surprise he hired us to play every Thursday from 9 pm till 4 am. He hired a different rhythm section to back us each night. They came from the legendary blues bands that just so happen to be off that night. Drummers and bass players like; Bob Anderson, Blue Blood, S.P. Leary, Billy Davenport, Fred Below, and Jack Meyers. Seeing our youthful enthusiasm, respect, and love, the blues masters themselves would get on stage with us and sing and play. And off the stage they would mentor us. It was Muddy Waters, Howin’ Wolf, Willie Dixon, Otis Spann, Little Walter, Hound Dog Taylor, and even the young guys like James Cotton, Buddy Guy, and Junior Wells. Wolf used to come up to the North side and sing with us, and then he took us on the road with him to New York. We took walks together in Village every morning. They were all in our corner. What incredible good fortune. In 1966 Jim and I moved to the North Side where we won an audition to take the place of the Paul Butterfield Band (not that anyone could take the place of that band) at the iconic blues club Big John's where the "Blues Rock Explosion" took place, and helped spread the blues around the world. A particular fellow came in night after night and would stay all night long. One night he came up to me; "Corky, I would like your band to jam with my band." I asked him; "Who's your band?" His band was the Chicago Symphony Orchestra, and he was Maestro Seiji Ozawa, considered to be one of the top 10 classical conductors of all time. OMG! 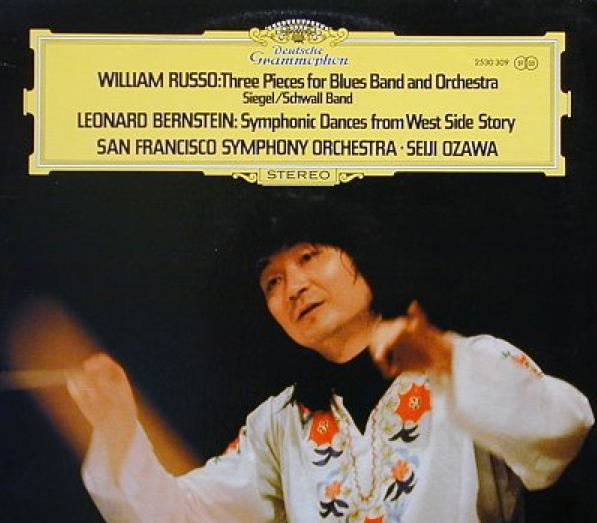 William Russo, Stan Kenton's arranger, trombonist, who composed the Titan Symphony for Lenoard Bernstein, was both fan and friend, and a perfect choice to write a blues classical symphony. We all agreed that we didn't want a symphony simply 'backing' a blues band or playing blues. We wanted a true collaboration where both genres maintained their own characters as 'equal' parts working together. We didn't know if anyone would like it, but we all felt we needed to do it. Seiji was risking everything by bringing a funky blues band on to the prescription concert stage with one of the top 3 orchestras of the world. But the 1968 concert with the Chicago Symphony was a great success as well as our invasions with New York Philharmonic, Boston Symphony, San Francisco Symphony, and invitations from all the major symphony orchestras all over the world. Eventually the exclusively classical label, Deutsche Grammophon put out "Three Pieces for Blues Band and Symphony Orchestra," which went 'platinum,' and then "Street Music a Blues Concerto" sold 100s of thousands. In 1975 I was commissioned by the City of San Francisco, and the San Francisco Symphony to write at piece for Arthur Fiedler for a Civic Center performance. I think therefore I am ... I think? I've never written anything in my life before, but the piece was a great success, and from there I was offered other commissions including two from Grant Park and Lancaster Symphony Orchestras, and one from the National Symphony. I completed my 5th commission "Symphonic Blues #7" to be premiered in May of 2017. It was in 1983 during the composition of some works for The Grant Park Symphony that I had an uncontrollable explosion of inspiration, and Chamber Blues was born. These projects have introduced an element of the blues to untold numbers of classical music lovers. From the blues masters to the world of classical music and my resulting career of juxtaposing blues and classical, this is something that happened to me. I didn't create it. As I say; "Symphonic Blues and Chamber Blues was neither my idea nor my fault." It grabbed me, carried me away, and it won't let go. It's dirty work, but somebody's got to do it." When people ask me, which do you prefer, blues or classical? I ask them; "Which do you prefer, breathing in or breathing out?" "I do very little. I ride the tsunami of the power of music, and I will do it till it crashes upon the shore. There are many great blues bands, and many great classical and chamber groups, and many amazing composers of symphonic music. Because of the great successes I've been blessed with for juxtaposing blues and classical in a collaboration that maintains their characters, I have always expected others to pick up that ball and run with it as a career and to create a national genre that brings music and people together in a unique way. Surprisingly and unfortunately that hasn't happened. So for now, Chamber Blues and Symphonic Blues are singular experiences and I'm your guy. I can only be in one place at one time. If you ever have a mind to experience a live concert that will take you places you have never been, subscribe to the bluesletter, and you will never miss knowing about a concert or seminar that is convenient for you and I will share with you the inside stories that manifest from this wild and beautiful place. "I owe my musical life to Wolf, Muddy, and all the blues masters and my classical mentors, Seiji Ozawa, William Russo, who not only showed me, but made what was 'impossible' possible." And Later; Hanging with Janis Joplin, producing Joni Mitchell, touring with Bob Hope and George Carlin, new perspectives on music, and other stories.